You can play as a Roman in Travian – but what games did the Romans themselves play in their free time? Games were of great importance in Roman culture. Most widely known are the great circus games, but table games for smaller groups of people were also played. Romans met up in public places or at their friends’ homes to enjoy playing many different games. This is shown by the reports of classical authors as well as graffiti and game boards carved on many buildings and in public spaces of that era. For many of these games, the rules have been lost in time, even if we still know the games’ names, such as Ludus Iantrucolorum, also known as “the soldier game”. 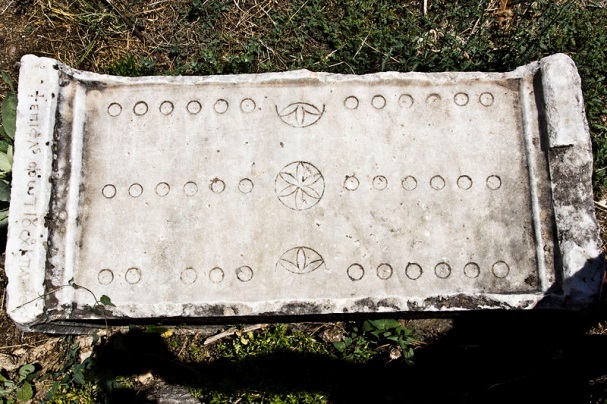 Other Roman games are still played today in a similar form. In wheel mill for example, the aim was to place the tokens in a straight line to form a “mill”, similar to today’s Six Men’s Morris. The game board was shaped like a wheel with eight spokes. 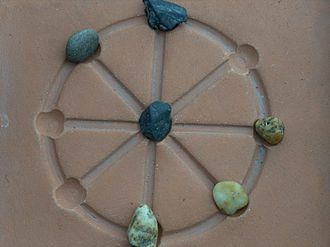 Each player was given three stone tokens, which they could place on one of the eight spots on the outer ring or in the center on the hub. Quadrangular boards have also been recorded, in which there were only four connections to the field in the middle, each from one of the square’s corners. Once all three tokens had been placed, players could always move one token to an adjacent spot on their turn. The aim was to form a straight line with the three tokens. Another famous board game was “Duodecim scripta” also called the “twelve line game”, which is quite similar to today’s backgammon. Each player had a total of 15 stone tokens, which had to be played through three sections consisting of twelve fields each. The game was played with three dice and in this early form, the opponent’s tokens were not taken like in modern backgammon. A later variant of the game, called “Tabula” allowed for taking an opponent’s tokens and it was placed on a board with two sections of twelve fields each, just like the game we are familiar with today. However, it was still played with three dice. Tabula was very popular and played with high stakes. The most famous however was the classic dice game with six-sided dice, just like those we still use today. The variant most widely documented has each player cast three dice, with the one with the highest total number being the winner. To work out the stakes, the sums of both players were added and the loser had to pay that amount to the winner. Even in ancient times cheating wasn’t unheard of. To prevent dice trickery and hustling, the Romans developed so called “Turricula” or dice towers. They were to ensure that dice could be cast properly and without being manipulated. Gambling with dice, be it Tabula or just a simple game of Alea (dice game) was widely popular with all classes; in fact it was so popular that the emperor banned playing for money. Those who got caught gambling had to pay four times their stake as a penalty. Only during the Saturnalia, that took place over a few days in December, was this ban lifted. The Teutons played even harder, at least if we trust the Roman historian Tacitus. Apparently even after they lost their shirt, they still gambled with their liberty and paid off their gambling debts as slaves. ← Travian: Kingdoms starts Open Beta! Did the Romans have a game similar to our ‘Jacks’?